MacGyver is in Russia to help Pete rescue the daughter of a Russian activist thought dead. After learning from the daughter that her father is still alive, they mount a rescue operation on a mental institution where he is being held, with MacGyver pretending to be an inmate, and Pete posing as his doctor. The rescue attempt is successful, and the activist remains in Russia to continue his work. I'll go with the boat chase in the beginning. Some sweet background music. The entire last ten minutes. We'll cover this below. "Caulking compound mixed with the proper hardening agent makes a unique version of Russian crazy glue." MacGyver puts this mixture along the edge of a pail which a guard then grabs on to and gets his hands stuck. Bonus points to MacGyver for then walking behind the guard's back no more than one foot away without him hearing a thing. A brief but fun dialogue at the 13:56 mark. Maria: "Are you certain we can do this?" Maria playfully laughs at MacGyver's wit (if you want to call it that) and puts her hand and head on MacGyver's shoulder. Maria: "Uh?!" as she inwardly curses Pete for ending her moment with MacGyver. Pete doesn't even try to pretend he's Russian, not even a hint of an accent. Wouldn't the mental institution be a little more curious about what an American doctor is doing with his American patient in Leningrad? A shake at 39:29. We don't actually see him shake his hand, but his arm goes up like he's about to before the camera cuts away, so I'm counting it. Somehow all of that was not enough to create any kind of alert level, as the other employees are calmly eating breakfast in the dining room. Maria adds a chemical to their drink that makes them all happy and allows the others to get away, though it's unclear why that was necessary because they didn't seem to care much about what was happening anyway. To top it off, we end the episode having to suffer through half-hearted platitudes about things like love of country and power of the people. 45:00 - pretty sure this is the only time in the series when we see MacGyver in a fur coat. Not a good episode. If I had to do it over again, I'd put it a bit lower. The mental institution is not a fun setting, there are no good villains, and after going through the trouble of rescuing the guy, they just let him stay in Russia and walk around the streets as he did before. Next, we'll be leaving Season 1 but staying with the clinical theme! I agree with you entirely on this one. It's a dud....and the only high point was the speedboat chase at the beginning, even though I suspect that was stock footage from a movie. It went downhill fast at the mental institute and little that happened even made sense to me. The jail break scene from the previous episode (chronologically....."The Escape") seemed all the more brilliant after this one where the entire escape constituted putting a psychotropic drug in the staff's community coffee pot. Strangely, I know a number of people who thought this episode was absolutely great. I'll never know why. It was the weak point of Season 1 for me....and I rated it #127. I wouldn't go as far as saying this one was absolutely great as some of Mark's acquaintances would, but I certainly enjoyed it. The psychiatric institute wasn't a very pleasant setting and initially the portrayal of the inmates felt a tiny bit offensive, but once MacGyver had befriended them and they were able to show their compassion rather than just madness it was better. I really liked Demetri's performance and the Chess Master was well portrayed as a really vulnerable yet intelligent man. The actress who played Maria seemed more comfortable with her role than some of those to feature so far and luckily any potential romance with MacGyver was kept to a very bare minimum! As a whole, it might have been full of unconvincing scenarios but it had one huge saving grace for me - it was the first chronological episode with Pete and MacGyver working together throughout. Starting later in series 2 meant that Pete was a constant prescence for me until I returned to begin with the Pilot episode. Although we had already been introduced to him by now in series 1, he had only played a minor role and we hadn't seen a real friendship between the two until now. This episode allowed Dana to expand the character from MacGyver's superior to a real trusted friend and it was full of fun and relaxed humour between them. To me this felt like the real start of what the series became. I also liked the actress who played Maria, and you're right that it is good to see Pete have a bigger role. "Maria: "Are you certain we can do this?" Maria: "Uh?!" as she inwardly curses Pete for ending her moment with MacGyver." Good moments but the bad ones are bad enough that overall it’s not very likeable episode for me either. The boat chase scene was spectacular. 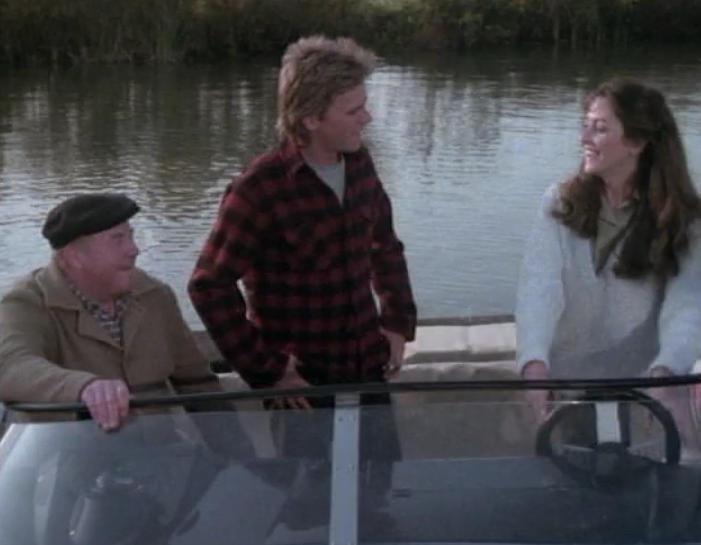 On first watch I thought there was another trio pursuing in a third boat as they show people who don’t look like any of those who boarded, for example, there’s a guy in a chequered jacket but in a yellow and black and not MacGyver’s red and black one, and a bald guy but with a very obvious moustache instead of Pete’s hat. Interesting music too which I can’t decide if I like or not. What I really didn’t like was the part when MacGyver is taken to the ward and him and Yuri put that insultingly stereotypical “acting crazy for no reason” portrayal of the mentally ill because Yuri and the chess man acted like they’ve never seen Suvarin before and had no idea what he was like. It was embarrassing to watch though it was acted well and probably fun to film. In the K-Pax book (the movie is nowhere near as good) the patients’ behaviour, while maladaptive to the outside world, makes perfect sense as soon as their backstories are revealed. I liked the part when MacGyver starts yelling “I quit, I quit!” as he lets himself pinned down on the bed (so knocking him out was completely unnecessary but at least it helped him to gain Yuri’s trust), probably because they looked more like a bunch of kids at that moment. The guy sitting in front of him on the bed (just) managing to keep a straight face was also fun to watch. This episode blended with For Love or Money in my memories, I was sure that MacGyver was going to blast Karsov’s window explosives made out of medicines from a cupboard. I liked how he sneaked out of the room right behind the glued orderly and the part when he was talking about the gate so Karsov could be smuggled into the room and this https://www.youtube.com/watch?v=ovBICKDlU3M. I don’t know why the plan was stretched over three days when MacGyver and Pete as new arrivals could have become prime suspects as soon as the mayhem started and I’m not sure what the drugging part was for as they were free to walk up to the entrance anyway and it played no part in getting past the doormen. In the Mythbusters MacGyver special, where Jamie and Adam use lightbulb-filaments when they are given an hour to get out of a locked room, Grant says it took MacGyver 52 seconds. I take it he meant from when the lamp is shown at 21:14 after Yuri’s “How will you get out of here?” to MacGyver’s “Let there be light” at 22:6 (I like the way he quietly says “I just have to get a set of keys. Excuse me.”). Just before Adam’s success at the 50th minute, Bob says, “They swap again, hoping Adam’s misspent youth might finally prove an asset”. The only other time I heard the word was Pete’s “You never played a round of golf in your entire misspent life!” to MacGyver in Countdown! I like this episode's crazy shenanigans, and who can forget that swinging punch from Mac when the one doctor opens the door? That will always be a thing of beauty. I think this one was so-so... I enjoyed the beginning and there were some interesting bits in the mental hospital, but overall the build-up didn't lead to much. And the great escape just dragged on for too long. The escape in The Escape was better executed - at least, it was more exciting. And the ending was a bit too soppy.